Earn Points on your Custom VF Kit! At VaporFi personalization is key and we want to make sure you are always in control of your vape experience.That's why we've introduced the ability to design custom vapes of your choice with the VaporFi Custom Vape Kit Builder. With our build-your-own option, you choose how you want things, fine-tune the performance, and finish it up with the essential accessories you dig! Endless styles, colors, and options await you including custom box mods or vape pens. Get ready for the vape of your dreams! We know one of the reasons vapers love VaporFi is our commitment to customization and personalization. That’s why we’re proud to offer this intuitive custom vaporizer builder, allowing you to tailor your vape pen/mod and tank to your favorite specifications, color, and more. There's something everyone, from conveniently size, pen-style batteries to powerful custom box mods - with options to add essential accessories. Our builder is able to produce custom vapes for all experience levels by removing the challenge of finding compatible components in a matching finish. A few tips for customizing the best vape setup for you include starting with a battery that fits your lifestyle. 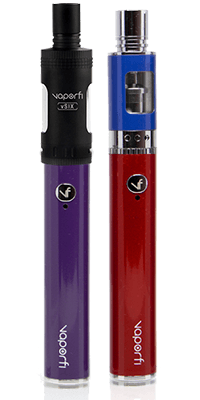 Vape pens are great for hiking, skiing/snowboarding, or just going out on the town due to their convenient size, ease of use, and bright colors. On the flip side, powerful vape mods give an epically satisfying flavor and vapor density but can be too large for on-the-go, and vapor production makes it difficult to use these devices discreetly. Box mods are great because they can provide more power and often grant increased battery life by offering batteries with a higher capacity. Next is the tank, and while they may look very similar to a new vaper, they offer you the ability to customize this unit to your exact vaping specifications. We have crafted some of the highest-quality atomizer tanks on the market and are proud to have a robust line of unique tanks, no matter your experience level. 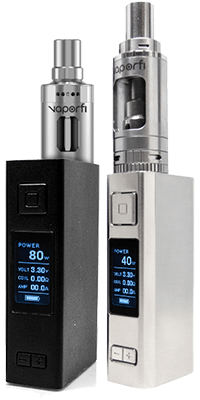 Units like the VaporFi vSix give you easy access to day-long sub-ohm vaping with little to no manual input. If you’re an advanced vaper who enjoys big lung hits, then the VaporFi Rocket 3 is for you, filling a void in the industry with an intuitive direct-to-lung design and variable wattage/temperature coils. Now that you’ve got an e-cigarette setup entirely customized for you, your experience level, style, and budget, don’t forget to pick up all of the necessary accessories. We’ve spared nothing when it comes to accessories customized for your setup. Again, no need to worry about compatibility because the Custom Vaporizer Builder does all the work for you. Coil packs are available to keep you vaping without pause and come in various power-levels (measured in ohms) to let you customize your vape even further. Pick up a pack because no one likes a burnt coil or waiting for replacements to arrive! Our amazing VaporFi Promise backs all of the options included in your VaporFi Custom Vaporizer! Create your perfect vape now and don’t hesitate to ask our friendly customer support if you have any additional questions.